What could be more perfect than a mystery about the man who invented the genre? I read this book in 1998 when it first came out. Seeing it on the shelf at the library was like bumping into an old friend. We just had to get together again. 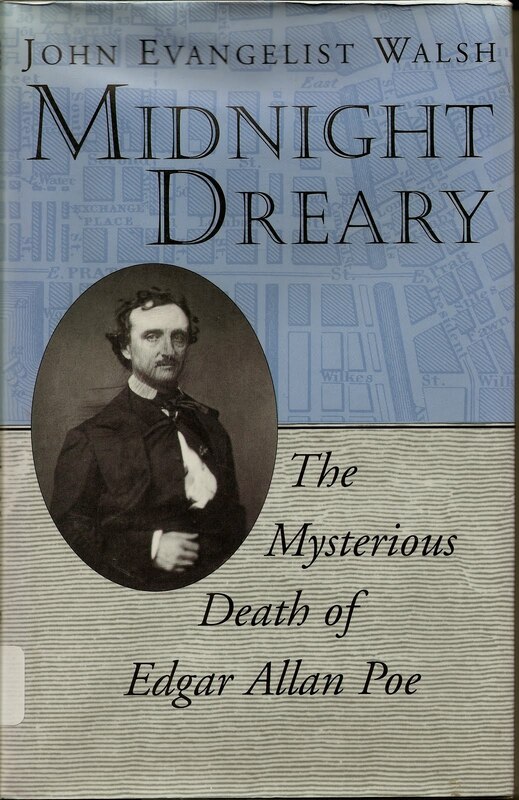 Poe was traveling from Richmond to New York by steamboat and landed in Baltimore when he disappeared for several days in late September and early October of 1849. He was found on the morning of October 4th badly in need of medical attention and dressed in old rags which were surely not his own. What happened in the last days of his life is an eternal mystery. There are several versions, the most prevalent being that he was given drink and "cooped" with several of Baltimores lower inhabitants the night before Election Day in October, 1849. That he was found in the 4th Ward and outside Ryan's Tavern gives creedence to this version. It has always been the one that I have adhered to. He was stupified with drink and taken from polling place to polling place to vote the ticket he was instructed to. But Mr. Walsh explores other avenues, while not entirely dismissing the Election night version. For instance, he has identified the mysterious "Reynolds" whom Poe called out for in his last hours. There was a Henry R. Reynolds present at Ryan's Fourth Ward in the Gunners Hall section of Baltimore in the days preceding the election and coinciding with Poes absence. But there was also a Jeremiah Reynolds, who was one of the leading characters in Poes longest work, the 180 page mini novel "The Strange Adventures of A. Gordon Pym, Late of Nantucket." Which Reynolds was Poe calling out to in his delerium? The fictious Reynolds, or the Ward Heeler? A fascinating read no matter what your opinion is of Poes disappearance and subsequent death. The book captures the city in the mid 1800's flawlessy and delves into areas not usually associated with the great writers death. For fans of Poe this is the JFK of it's time. And like the mystery in Dallas, I hope they never solve it. The speculation is simply too much fun.